A couple of days ago the Internet went wild with the #EpicFail of DashCon. Today I finally saw the response that the Denny's restaurant twitter team posted on the 16th. OMG. 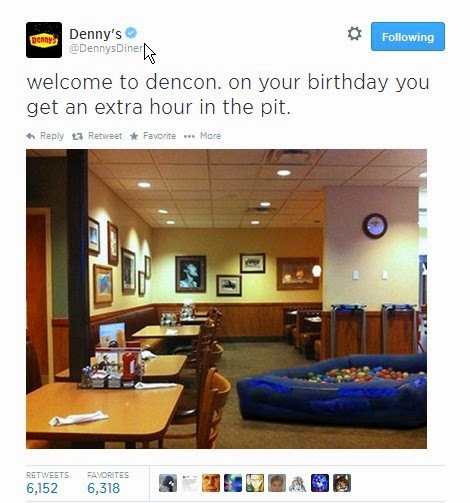 Denny's has one of the best Social Media teams going. They are fast and they are funny. They are pretty much rockin it on Tumblr too. This BallPit response is, to me, the equivalent of Oreo's response to the lights going out at halftime at the SuperBowl two years ago. They immediately came up with a picture of a single Oreo in a dark room only being lit up by the light given off possibly by a cell phone. Their tagline was "You can still Dunk in the Dark". The hashtag #DunkintheDark immediately went viral. This is when the Internet is the most fun. When it is silly fun making an otherwise EpicFail into an Epicly Entertaining shared moment. This is just another reason I love Twitter. It is fast and it's fun. At a conference, like at Comic-Con, Twitter is essential. By following the hashtag #SDCC or #SDCC2014 (for San Diego Comic-Con) you can find out what is going on in the moment. For example, if one of the booths in the exhibit hall has a giveaway that is going on just for a short time they can send out a tweet alerting everyone to the giveaway and their booth number. By adding the hashtag to this tweet everyone following on Twitter can know what is going on right at that moment. It is a great way to alert attendees to last minute changes in the schedule. One of the hashtags I have been following this week is #IsItSDCCyet - loving this fan conversation about getting to Comic-Con. So, if you are on Twitter be sure to follow these Twitter accounts for all of the updates from the Conference next week. And don't forget the hashtags. Next week you won't have to wonder about what hashtag to use. Just look at what is trending and you'll know.